The Tube – “Mind the Gap,” you say? “Thank-you, I think I will!” And with that final piece of advice spoken in unmistakably crisp and clear British diction, my first ride on London’s infamous “Tube” set forth and I was hooked from there. This amazing feat of British engineering is a labyrinth of long and deep subway tunnels and pedestrian passages that serves locals and tourists well. Just when you think you can’t possibly go any further toward the centre of the earth’s core, down you go again on another impossibly steep escalator (yes, this is not for the faint of heart or anyone prone to light-headedness!) in search of your platform. The trains run frequently and overhead digital signs and regular speaker announcements keep passengers well-informed of subway traffic. The signage and detailed maps also do a great job of getting any wayward travellers back on track! The Tube is definitely one of the most user-friendly and delightfully polite and pleasant underground systems that I have been on. Don’t be fooled by the cold exterior of this stone gate/archway…a pleasant, pretty and picture-worthy park awaits on the other side! 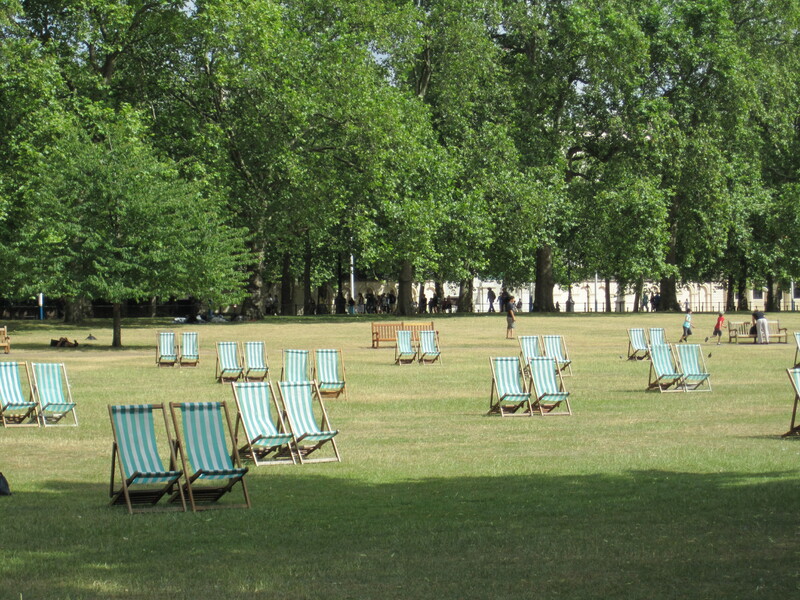 St. James Park – There’s nothing like spending time in a great green space on a warm and sunny Saturday afternoon and that is exactly what jolly ol’ London town served up for the lollygangers and intrepid tourists alike enjoying a stroll about this lovely landmark. 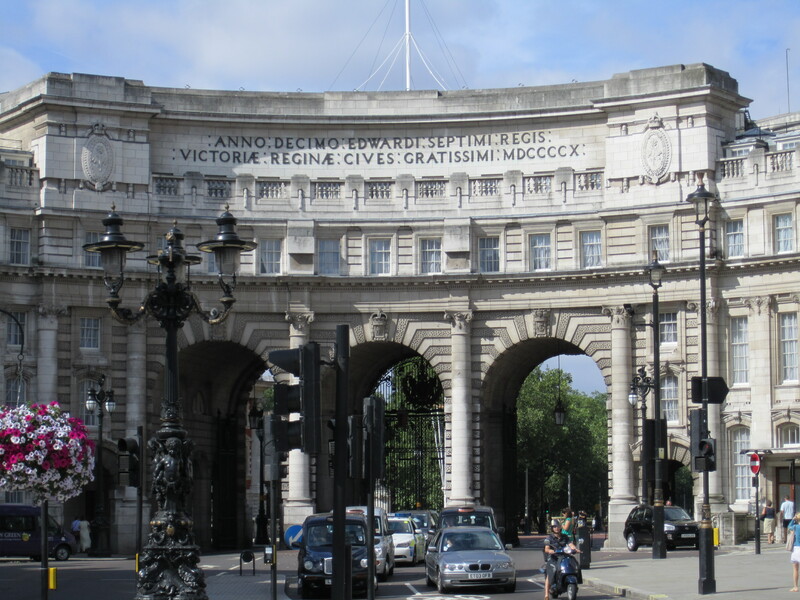 With government buildings/courtyards on one end and Buckingham Palace on the other, there is a lot to take in as you make your way down the wide and scenic pathways. The ‘Changing of the Guard’ ceremony draws a large and boisterous crowd at the palace, but the park is quiet in other areas for those who just want to sit in repose and soak up the aura of history and nature’s beauty that is all around. Soaking up the Saturday sun in St. James Park. Big Ben looms large in all its glory! 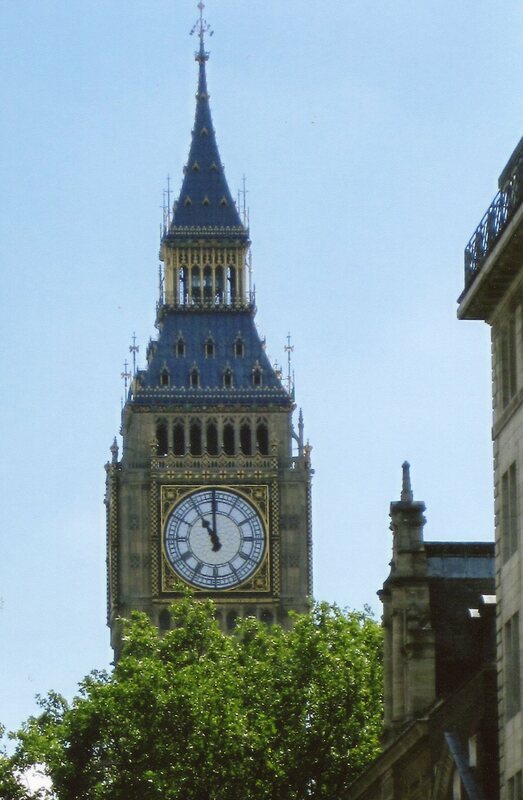 Big Ben / House of Parliament Building– Disraeli, Chamberlain, Churchill, Thatcher, Major, Blair…the list of stalwart and strong British Prime Ministers that have graced the parliamentary halls and meandered the streets and alleyways in the government district is impressive indeed! The House of Parliament stands tall and proud along the Thames River and, not far off at Westminster Palace, Big Ben continues to boom its bell/chimes and maintains its status as one of the most recognizable symbols of London. Freddie Mercury lives on through the musical We Will Rock You. The West End Theatre District – From the annals of history to the current day craze of pop culture, there is bound to be a play/musical showing in the West End that captures your interest. We Will Rock You, celebrating the music of Queen, caught my fancy on this trip and seemed very fitting to join in an audience sing-along of this beloved British band’s greatest hits. 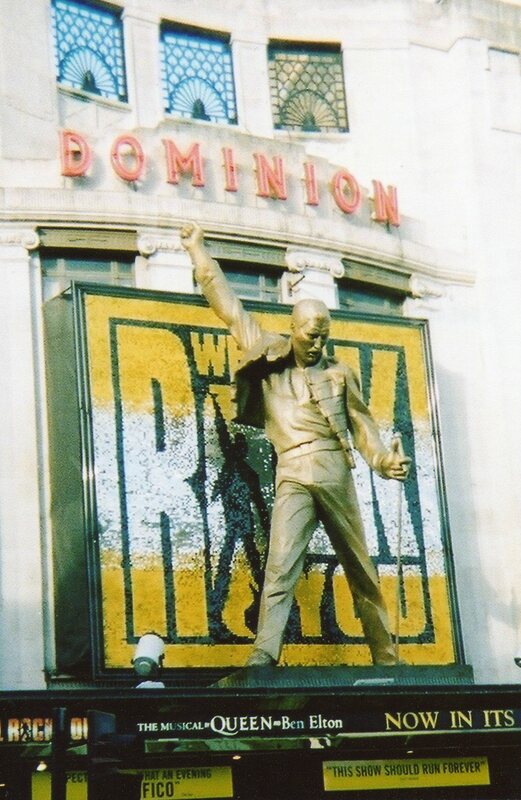 The gleaming, gaudy and golden life-size statue of Freddie Mercury outside of the Dominion Theatre also grabbed my attention! 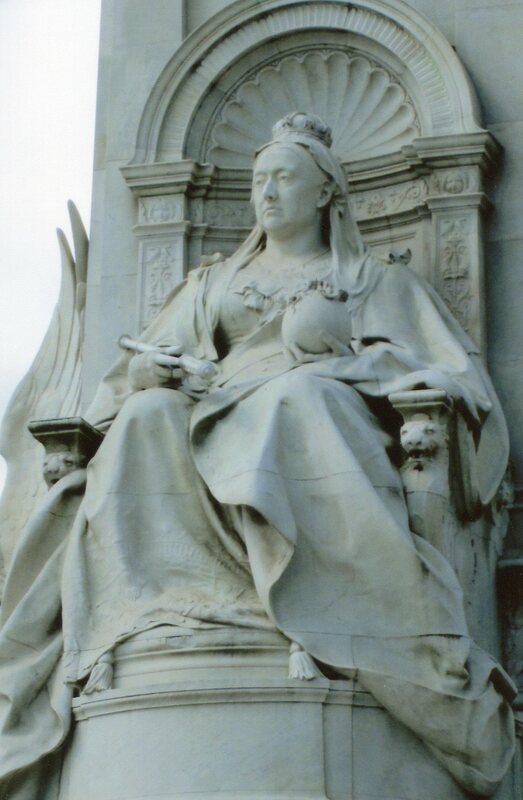 Queen Victoria Monument – Drawing inspiration from multiple artistic mediums and materials, the Queen Victoria monument offers much to please the eye at every level that it is observed from. From the golden glint of the guardian angel perched precariously on one foot at the top, to the stoic, silent and solid stone carving of Queen Victoria herself in the middle, to the glorious green marble guards and lions who sit at the base as the first line of protectors, it is a sight to behold and a worthy tribute to this mighty monarch who ruled for over 60 years in an era of tremendous growth for the British Empire. Piccadilly Circus / The National Gallery / The Tower of London and so much more – Whether you’re mingling with the mobs of people at Piccadilly Circus, or admiring the myriad of marvelous art pieces at the National Gallery, or crossing London Bridge en route to the magical and mysterious Tower of London there is plenty to see and do, even if you only have two days to explore! Here are a few more pictures of my short, but oh so sweet, stay in jolly ol’ London town…I will be back! 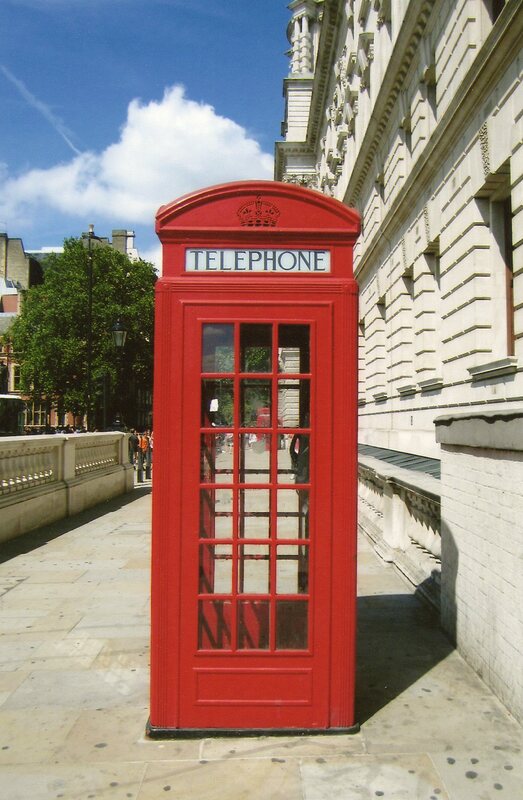 The Red Telephone Box is a familiar sight on the streets of London. 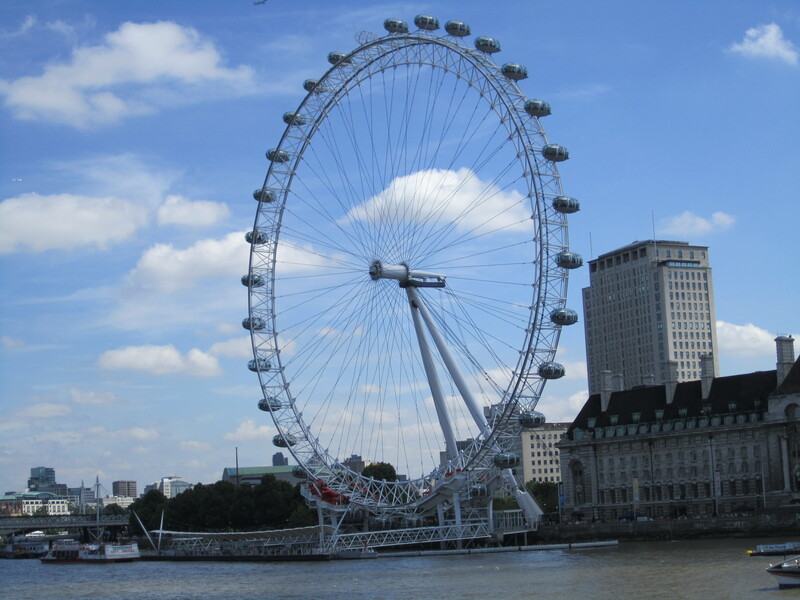 The London Eye offers great views of the city. No talking, please! 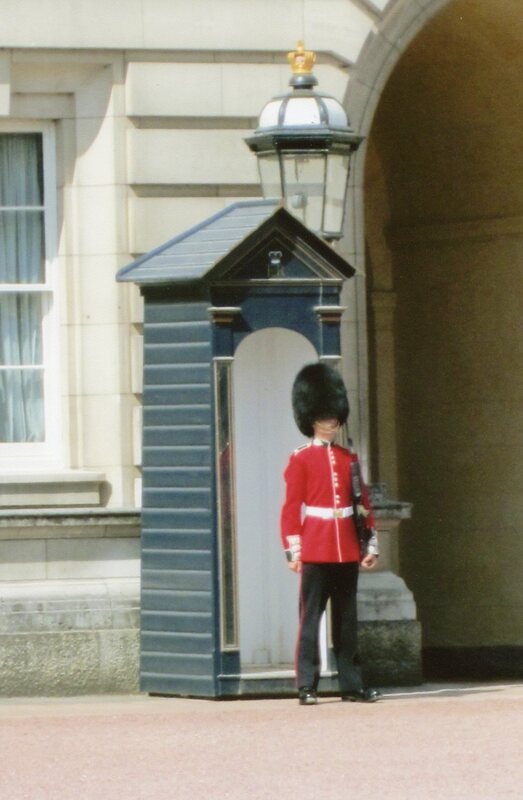 Standing on guard at Buckingham Palace. 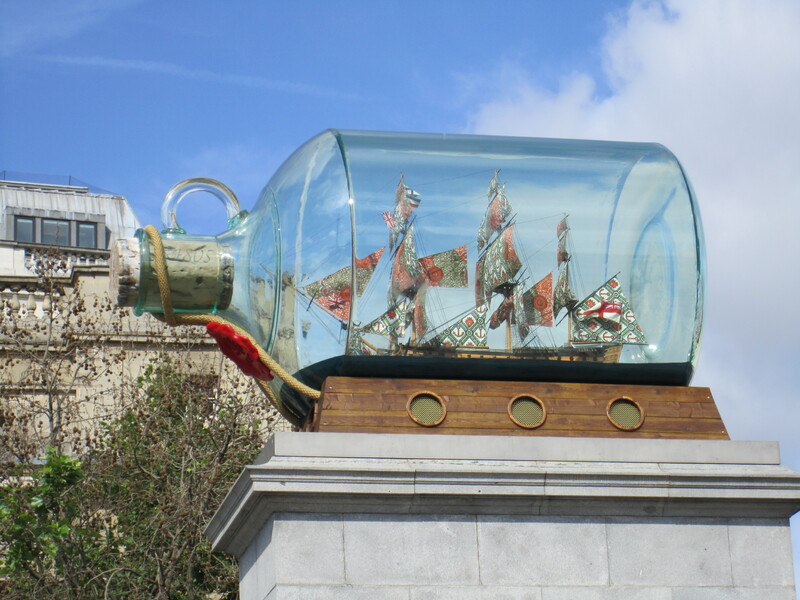 An ultra-large ‘Ship in a Bottle’ on display outside of the National Gallery. 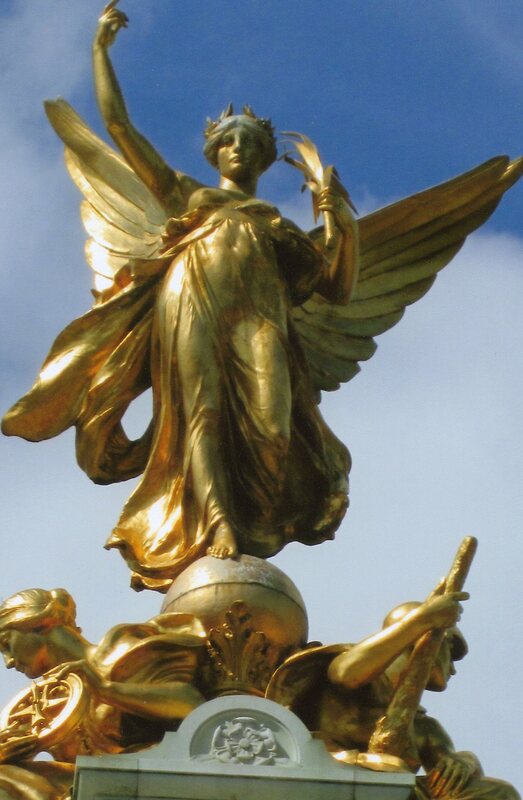 A guardian angel watches over the Queen Victoria monument. 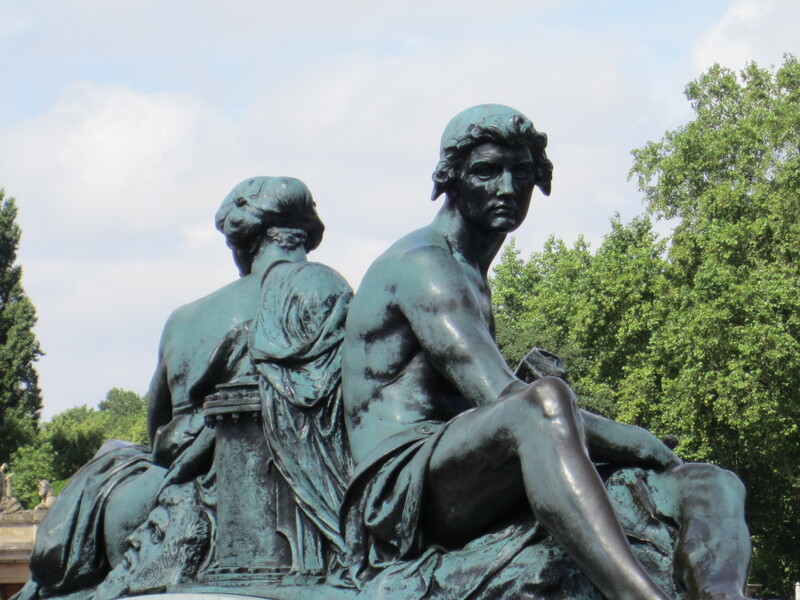 Green marble figures surround the base of the magnificent Queen Victoria monument.